Entrepreneurship can be broken down into management, marketing and finance. Understanding and maintaining each of these “legs” of the entrepreneurial stool is critical to the success of your business. If you remove one, then the stool falls over. If one is weak, then the stool collapses. Proper management of a business is the first leg of the stool. Within entrepreneurship, management includes everything from conceiving the business idea to organizing your time to eventually managing employees. For example, if you start a business that sells shoelaces, there are a number of things you will have to manage. You’ll have to find a supplier of your shoelaces (probably just a store). You’ll have to monitor your inventory (return to the store when you start to run low). And you’ll have to make sure your customers are happy so they’ll return to your business (maybe as simple as a phone call or email). The management leg should be structurally sound and the first leg you attach to the stool. The second leg is marketing. Marketing consists of everything you do to introduce potential customers to your business and eventually sell them your product or services. As I mentioned last week, marketing is more than just advertising. In the shoelace example your marketing will consist of finding people who need shoelaces and convincing them to buy from you. One strategy could be to go to a mall or somewhere with a lot of foot traffic and watch people’s shoes as they walk by. If their laces are frayed or coming untied, then they might need new ones. That’s when you approach them and introduce your product. The marketing leg must be accentuated with illustrious designs and appeal to your customer. Attach this leg second. Finance is the third and final leg of the stool. In many cases it doesn’t take too much start-up cash to create a simple business. But once you want to really grow your business, you’ll likely have to make a substantial investment. At which point you’ll probably need to find funding. Additionally, keeping track of the money you spend and the money you make (a.k.a. accounting) should be included in this leg. With your current shoelace, guerilla marketing strategy you’re only selling about 10 packs of shoelaces a week. You realize that there are a lot of people who need shoelaces but you simply don’t have a chance to meet them. So you decide that creating a website is in the best interest of your business. However, this website is going to cost you at least a couple thousand dollars. Financial decision-making will help you determine if this is a viable option. The finance leg is going to have a lot of unsightly knots in it but will round out your entrepreneurial stool. So now that you have constructed your 3-legged stool, it’s time to establish your business. When you first start out, your business will be a baby on the stool. But as your business grows, that baby will also grow, hopefully becoming a very fat man. However, as your business grows, you’ll also have to work on its foundation, the stool. The birth of your business is like putting an infant on your stool. At this point the stool doesn’t have to be very big or sturdy in order to support the baby. But it still must have all 3 legs. As you start making your first sales, the baby will start to grow. As the baby becomes a toddler, you should closely monitor the sturdiness of your stool, but probably won’t have to make any adjustments. Coming back to the shoelace example, in your business’s infancy you’re selling a few shoelaces here and there but not really on a consistent basis. So the management and finance aspects of your business won’t have to change much. But you should start adding jewels or other decorations to your marketing leg to make your business more attractive to potential customers. As you start making consistent sales and building a loyal customer-base, the infant becomes a child. Children become unruly and will put extra stress on the legs of your stool. Once you have a child, you’ll have to start looking into fine tuning the legs of your stool. Now you’re starting to sell shoelaces fairly consistently and have a couple loyal customers. This is where you can improve your management leg by going the extra mile to make sure those customers are happy. You might want to put a stained-finish on your management leg. Additionally, you’ll have to keep track of your finances by adding tick marks to the finance leg. Adolescence is one of the most awkward points in life and business. You’re not sure whether you want to grow up or remain a child. For this example, the person on your stool chooses to grow up, but it’s not that easy. There are tough lessons to be learned and even tougher obstacles to overcome. This is the point in which you’ll really have to examine the sturdiness of your stool. So you have loyal customers and you’re making plenty of other 1-time sales, but what do you do now? You can choose to settle with the current state of your business (childhood). Or you can choose to grow your business by entering other markets with new potential customers (adolescence). If you choose the latter, you’ll probably need help. Perhaps you hire a friend/personal assistant to manage your inventory and customer service. Maybe you hire a graphic designer and web developer to provide you a logo and a website where you can reach other markets. You could possibly bring in a Certified Public Account (CPA) to handle your finances. Each one of these will provide stability to your stool so you can support your growing business. Once your business hits adulthood, you’re competing with the big guns. Ideally your stool-person will continue grow fat by eating your profits. But you have to supply him with those profits in order for him to get bigger which is hard to do. However, if you do manage to consistently grow your business, then you’ll have to develop your stool at the same time. This is when your shoelace business becomes a shoelace enterprise. At this point, you’ll definitely need help. To ensure that your stool doesn’t collapse under the pressure of your business, you’ll have to add new layers to each leg. You’ll need a team/department of people for each leg of your business. 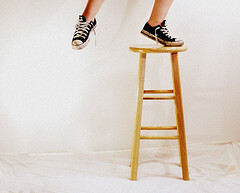 Because if one of those legs break, it’s hard to repair it and get you fat stool-person back up on the stool. Management, marketing and finance are the 3 legs of the entrepreneurial stool. Each leg is just as important as the others to the entrepreneurial success of the stool. Stools are only as sturdy as their weakest leg. As your baby business grows into a fat business, each leg of the stool needs to be monitored and developed accordingly. If they are not, then your business won’t grow and maybe even collapse. If you enjoyed this article, you should subscribe by email. Thanks for reading and leave your comments below. I appreciate any feedback I can get.